1. A router has two serial interfaces and two FastEthernet interfaces. It needs to connect to a wide area link to the main office and to four VLANs in the local network. How can this be accomplished in the most efficient manner? 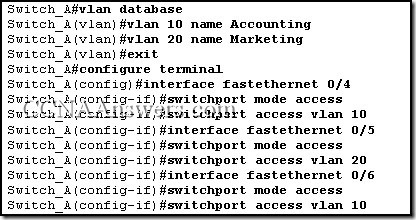 Connect a trunked uplink from the switch to a router FastEthernet interface and create logical subinterfaces for each VLAN. Use a hub to connect the four VLANS with a FastEthernet interface on the router. 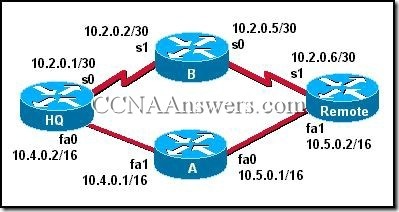 Two additional FastEthernet interfaces are required to interconnect the VLANs. Use serial to FastEthernet transceivers to connect two of the VLANs to the router. 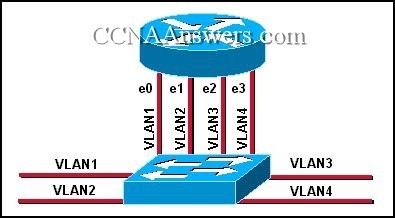 Attach the other two VLANs directly to the available FastEthernet ports. Add a second router to handle the inter-VLAN traffic. The switches in the diagram are connected with trunks within the same VTP management domain. Each switch is labeled with its VTP mode. A new VLAN is added to Switch3. This VLAN does not show up on the other switches. What is the reason for this? There are no ports assigned to the new VLAN on the other switches. It would free 2 switch ports on each switch. It would free 3 switch ports on each switch. It would save 2 cabling runs. It would save 3 cabling runs. It would provide three times the bandwidth of the individual links. It would allow adding more VLANs without requiring more cabling or switch ports. A router is configured to connect to a trunked uplink as shown in the graphic. A packet is received on the FastEthernet 0/1 physical interface from VLAN 10. The packet destination address is 192.168.1.120. What will the router do with this packet? The router will forward the packet out interface FastEthernet 0/1.1 tagged for VLAN 10. The router will forward the packet out interface FastEthernet 0/1.2 tagged for VLAN 60. The router will forward the packet out interface FastEthernet 0/1.3 tagged for VLAN 60. The router will forward the packet out interface FastEthernet 0/1.3 tagged for VLAN 120. The router will not process the packet since the source and destination are on the same subnet. 6. A switch in a VTP domain sends an advertisement request. What will be the response? A configuration status reply will be issued from the closest client switch. A three-way handshake will establish a configuration session with the VTP server. Summary and subset advertisements will be sent by the VTP server. The configuration version number will be set to zero and all switches in the domain will issue advertisements regarding the state of their VLANs. Verify that the new switch has a lower configuration revision number than the other switches in the domain. 10. By default, to which VLAN does a trunked link belong? If trunking were not used in the network shown in the graphic, how many links would be required to carry the traffic for all the VLANs between the switches? Host A sends a frame to host B over the network shown in the graphic. Each link has been labeled with a letter. 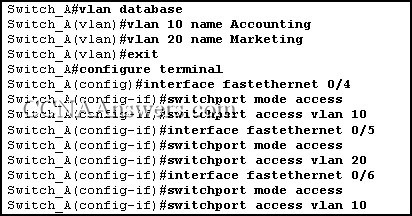 On which links along the path between hosts A and B will a VLAN ID tag be included with the frame? This design will not scale easily. 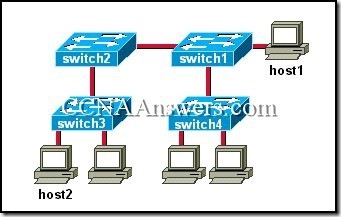 This design exceeds the maximum number of VLANs that can be attached to a switch. Devices on the different VLANs can communicate through the router. This design requires the use of the ISL or 802.1q protocol on the links between the switch and the router. This design uses more switch and router ports than are necessary. The router merges the VLANs into a single broadcast domain. A port on a switch in the management domain has changed to blocking mode. The advertisement revision number has reached n+1. The LAN devices are configured as shown in the diagram. Why are Host1 and Host2 unable to communicate? No VTP domain has been configured. A router is needed to forward traffic between the VLANs. The switch does not have an entry in its CAM table for Host2. The host IP configurations are on different networks. The ports on each VLAN must be grouped together on the switch. Switch1 is using VTP version 1 and Switch2 is using VTP version 2. 17. What does a client mode switch in a VTP management domain do when it receives a summary advertisement with a revision number higher than its current revision number? 18. What information does frame tagging add to each frame to allow delivery of frames across a switched trunk? Transparent mode switches pass VLAN management information that they receive to other switches. Transparent mode switches can adopt VLAN management changes received from other switches. Transparent mode switches send out updates informing other switches about changes in the status of their VLANs. 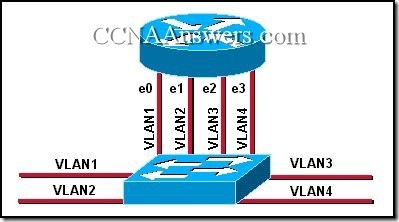 A new host needs to be connected to VLAN 1. Router RA is attached to the VTP trunk and configured as shown in the output contained in the graphic. Which of the following IP addresses should be assigned to this new host? Devices on different VLANs communicate through VTP. Devices on different VLANs communicate through routers. Devices on different VLANs communicate over a trunk link between switches. Devices on the same VLAN communicate through a router. Devices on the same VLAN communicate through Layer 2 switches.